This is the second in a series of blog posts examining the technologies that are driving the development of modern web and mobile applications. "Modern Application Stack – Part 1: Introducing The MEAN Stack" introduced the technologies making up the MEAN (MongoDB, Express, Angular, Node.js) and MERN (MongoDB, Express, React, Node.js) Stacks, why you might want to use them, and how to combine them to build your web application (or your native mobile or desktop app). The remainder of the series is focussed on working through the end to end steps of building a real (albeit simple) application – MongoPop. This post demonstrates how to use MongoDB from Node.js. MongoDB provides the persistence for your application data. MongoDB is an open-source, document database designed with both scalability and developer agility in mind. MongoDB bridges the gap between key-value stores, which are fast and scalable, and relational databases, which have rich functionality. Instead of storing data in rows and columns as one would with a relational database, MongoDB stores JSON documents in collections with dynamic schemas. MongoDB&apos;s document data model makes it easy for you to store and combine data of any structure, without giving up sophisticated validation rules, flexible data access, and rich indexing functionality. You can dynamically modify the schema without downtime – vital for rapidly evolving applications. It can be scaled within and across geographically distributed data centers, providing high levels of availability and scalability. As your deployments grow, the database scales easily with no downtime, and without changing your application. MongoDB Atlas is a database as a service for MongoDB, letting you focus on apps instead of ops. With MongoDB Atlas, you only pay for what you use with a convenient hourly billing model. With the click of a button, you can scale up and down when you need to, with no downtime, full security, and high performance. Node.js is an asynchronous, event-driven engine where the application makes a request and then continues working on other useful tasks rather than stalling while it waits for a response. On completion of the requested task, the application is informed of the results via a callback (or a promise or Observable. This enables large numbers of operations to be performed in parallel – essential when scaling applications. MongoDB was also designed to be used asynchronously and so it works well with Node.js applications. If you don&apos;t have Node.js installed then that needs to be done before building the application; it can be downloaded from nodejs.org . The scripts section defines a set of shortcuts that can be executed using npm run <script-name>. For example npm run debug runs the Typescript transpiler (tsc) and then the Express framework in debug mode. start is a special case and can be executed with npm start. Note the list of dependencies in package.json – these are the Node.js packages that will be installed by npm install. After those modules have been installed, npm will invoke the postinstall script (that will be covered in Part 4 of this series). If you later realise that an extra package is needed then you can install it and add it to the dependency list with a single command. For example, if the MongoDB Node.js driver hadn&apos;t already been included then it could be added with npm install --save mongodb – this would install the package as well as saving the dependency in package.json. Once running, browse to http://localhost:3000/ to try out the application. When browsing to that location, you should be rewarded with the IP address of the server where Node.js is running (useful when running the client application remotely) – this IP address must be added to the IP Whitelist in the Security tab of the MongoDB Atlas GUI. Fill in the password for the MongoDB user you created in MongoDB Atlas and you&apos;re ready to go. Note that you should get your own URL, for your own data set using the Mockaroo service – allowing you to customise the format and contents of the sample data (and avoid exceeding the Mockaroo quota limit for the example URL). Note that the collection method on the database connection doesn&apos;t support promises and so a callback function is provided instead. The function explicitly creates and returns a new promise (which will eventually be resolved or rejected). The function returns another function call which, in turn, returns a promise (which will eventually be resolved or rejected). The function returns a value – which is automatically turned into a resolved promise. The function throws an error – which is automatically turned into a rejected promise. That function isn&apos;t part of the final application – the actual code will be covered in the next post – but jump ahead and look at routes/pop.js if your curious). Note that collection.aggregate doesn&apos;t actually access the database – that&apos;s why it&apos;s a synchronous call (no need for a promise or a callback) – instead, it returns a cursor. The cursor is then used to read the data from MongoDB by invoking its toArray method. As toArray reads from the database, it can take some time and so it is an asynchronous call, and a callback function must be provided (toArray doesn&apos;t support promises). The rest of these database methods can be viewed in db.js but they follow a similar pattern. 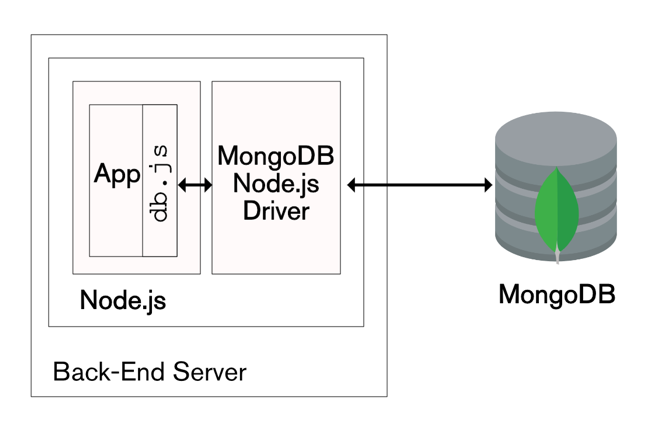 The Node.js MongoDB Driver API documentation explains each of the methods and their parameters. This post built upon the first, introductory, post by stepping through how to install and use Node.js and the MongoDB Node.js driver. This is our first step in building a modern, reactive application using the MEAN and MERN stacks. The blog went on to describe the implementation of a thin layer that&apos;s been created to sit between the application code and the MongoDB driver. The layer is there to provide a simpler, more limited API to make application development easier. In other applications, the layer could add extra value such as making semantic data checks. The next part of this series adds the Express framework and uses it to implement a REST API to allow clients to send requests of the MongoDB database. That REST API will subsequently be used by the client application (using Angular in Part 4 or React in Part 5).